After two or more years, seedlings can be planted in the farm field. 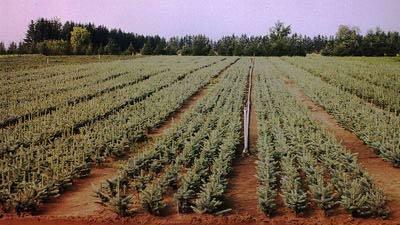 Christmas tree conifer seedlings are grown from seed in beds or greenhouses. Except on the largest tree farm operations, this is usually a separate business, requiring a lot of skill and attention. After two or more years, seedlings are 20 to 40 centimetres high and sufficiently strong to be planted in their permanent spot in the farm field.